Today was one of the most eventful days of our hike so far. We hiked in three states, went to the ATC headquarters, and had a few relaxing hours in Harpers Ferry. We left by 8:00 this morning and got off the VA-WV border at Loudon Heights where we crossed into West Virginia. We were exhilarated to enter a new state. We loved hiking in Virginia. It was such a beautiful state with so much varied hiking. We spent 40 days in the state, the longest amount of time we’ll spend in any state along the AT. We have decided that the Virginia Blues don’t exist. Sure, the past few days we have been looking forward to entering a new state, but that doesn’t mean that I look back on our time in Virginia in a negative light at all. In fact, the two worst days of our hike so far weren’t even in Virginia. Everyday was a good day in VA and we met so many amazing people there. I loved Virginia so much, I look forward to going back there very soon. As we crossed the Shenandoah River Bridge, my excitement started to build as I knew we were so close to the Appalachian Trail Conservancy (ATC) headquarters in Harpers Ferry, WV. After a quick climb, we took a side trail into town past the old Storer College, the first African-American college in the South, and before we knew it we were at the headquarters. We were welcomed by a nice volunteer and we decided to hang out there for awhile. We charged our phones, called home, and perused the old albums of thru-hikers who had passed through Harpers Ferry in former years. 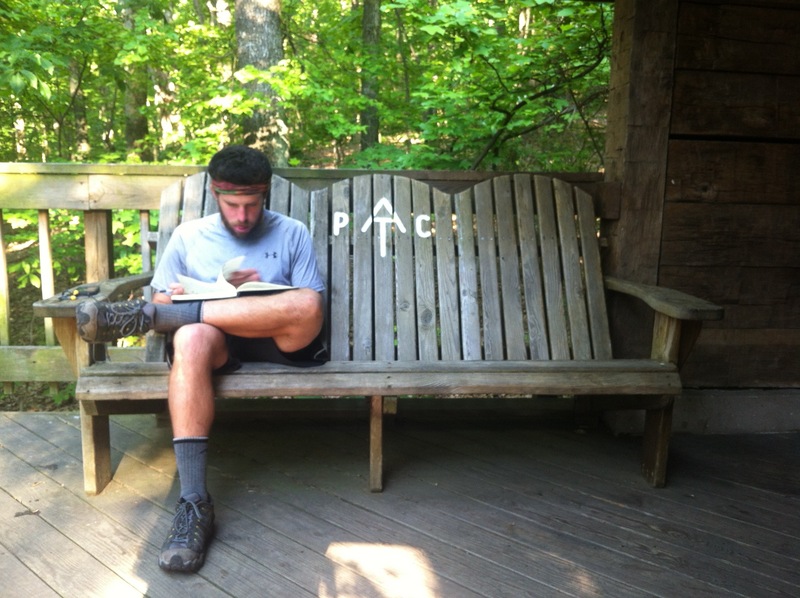 We found some 2012 thru-hikers we had met this year including Mamaw B! We proceeded to have our photo taken that every hiker who passes through gets done in front of the ATC sign out front. 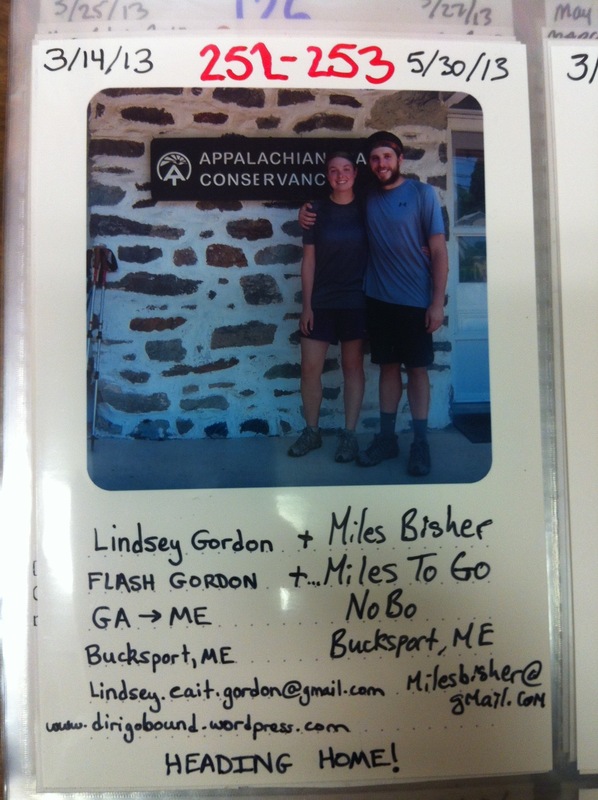 We are the 252nd and 253rd thru-hikers to pass through Harpers Ferry this year. We were #’s 390 and 391 at Springer Mountain. We also found out that 2,700 hikers started at Springer Mountain this year! Wow. That’s 1,000 more than in 2011. To think that over 2,300 people started after us this year is insane. We are certainly ahead of the pack and I’m so thankful we are. I wonder if the number of completed thru-hikes will be lower or higher than last year. After picking up some absolutely amazing brownies and other food from Miles’ grandmother at the post office, we headed to the lower town to eat a late lunch at the Cannonball Deli, resupply, and grab an ice cream at Scoops. By the time we did all that and played the tourist among a few of the Civil War sites and John Brown’s Fort, it was 6:30. We still had over six miles to hike, so we were prepared to night-hike. We actually didn’t mind waiting until the evening to finish hiking. It was so hot today, hiking in the setting sun was a welcome relief. We crossed over the Potomac River and suddenly we were in Maryland! There wasn’t a sign to mark the occasion, but we were excited nonetheless. We had super flat miles along the towpath out of town. We saw a plethora of wildlife in this section and among the more interesting sights of the day, a woman riding a bike and texting simultaneously. Who knew you could keep your balance and text at the same time! But really, we saw so many animals along this small stretch. We saw 14 turtles, a beaver, and a vulture. Earlier in the day, we saw a heron and tonight we saw a frog. We were on a hiker high from our accomplishments today and ended up making it to the shelter at 8:45, just before we needed our headlamps to hike. We were tired and super sweaty, so we are staying in the shelter tonight with the damn bugs. I already had to kick two off my sleeping bag. We weren’t really hungry, so I drank an orange soda and had a brownie for dinner. Our visit to Maryland will be short, so we hope to enjoy our time here. And I thought the excitement of this thru-hiking thing was supposed to wear off. I don’t want to jinx myself, but it hasn’t happened yet and I’m really hoping it never will. We love it on the AT! Everyone is asleep and here I am blogging in the quiet night, only distant cars to be heard in the valley below. I enjoy the peace and the silence. Late nights when no one else is awake is when I work best, when I’m inspired the most, and when the ideas come pouring out my ears. I can reflect on the day with no disturbances, only my thoughts to entertain me. To say it simply: I’m happy. As an old friend once said to me, “happiness is contentment”. I recently started reading about the appalachian trail. Today I stumbled upon your blog and read the entire thing! I hope to be able to do it one day. Safe travels to yall. Totally Agree, there was never any “Blues” for me in VA either!! The person who started that myth must have been hiking in rain for weeks :O) I’m a little behind on your Blog but Congratz on 1000 miles!! Thanks Boots! Great to hear from you! Glad that you came across our blog. ← We made it to Harpers Ferry, WV!